The old days of Kai Tracid's trance and acid are long gone. For a period at least three years long, it seemed as though Kai Tracid had mysteriously disappeared off the face of the planet. Aside from a few select DJ gigs, Kai Tracid pretty much slipped into the void of obscurity for a while. Apparently, he had taken a bit of a vacation (okay, his absence was much too long to simply be a vacation), as well as take a mental musical journey of sorts. In other words, he pretty much ran out of ideas and took some time off to get new ones. So his website pretty much went untouched for a long time, until the beginning of 2007, when a new message was posted to all, saying that his new album, "Immortal - Studioworx 2003-2006", was ready to go. As of the writing of this review (April 2008), there's still been no sign of that album, but what we did get are a couple of two-track vinyls from the guy showing us just what's been cooking in the composition kitchen of Kai Tracid, one of which is the vinyl featured here (which is also available via iTunes and likely other major digital music shops). It features two tunes, "Depressive Mood" and "Discreet Charm". 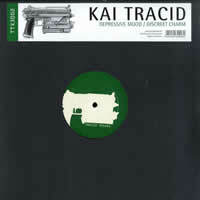 Back when he was a regular producer, Kai Tracid's releases were generally about the combination of trance music elements with acid elements. He was able to skillfully combine the two genres to create powerful songs that could get a dancefloor quickly filled. Well, it seems that during his three-year sabbatical, the trance aspect of his productions was completely tossed away, and what remains is a more minimalist acid structure. However, both the songs on this vinyl ultimately feel somewhat weak compared to past works, so I have to say... Kai Tracid's been spending more time on the couch eating potato chips these past few years than connecting with his musical side. Take, for example, Depressive Mood. While the everlasting melody (which arrives in full after 1:17 of absolute minimal build-up) is somewhat fun and a bit off-key at times, it never really goes anywhere exciting. In fact, the first half of the track is just that melody and some standard beats -- not even a bassline! That could haved really helped this tune reach a higher plateau. Granted, the strength of the melodic synth fluctuates but that's not enough to warrant a track over seven minutes long. Thankfully, a back-up acid synth serves as a makeshift bassline with what seems like a similar pattern as the main synth... but wait! They are never played in tandem! How horrific; it would have been great to have heard the two together! However, they are not, and since neither part is impressive on its own, the song has a minimal yet dismal quality to it. Perhaps Discreet Charm (yes, that is how Mr. Tracid opted to spell "discrete") can prove that there is still some energy left in this vinyl! But alas, it was not meant to be, unless you are a HUGE fan of the mish-mash that is the minimalist acid genre. There actually isn't much to be said about this track; its ambient monotony for the first couple of minutes is definitely not worthy of much mention. Some quick poppy square notes over a muffled bass is the most excitement you can really expect from "Discreet Charm". The charm of this song truly is discrete because I certainly failed to find it. Overall, it feels like Kai Tracid has lost his edge ever since he took his extended vacation from the music scene. Instead of creating the wonderful trance and acid combinations of the past (and often including spoken word messages that protest the use of drugs and promoting the enjoyment of life, as was frequently the case in many songs), the tracks are darker and lack any particular depth. I'm quite disappointed with this release because I know what he is capable of; what is offered here is quite subpar. I hope he gets his act together and puts out something else worthy of the Tracid name somewhere down the road.